you need to stay healthy. With health insurance, you don’t have to put off checkups, use the emergency room for everyday health needs, or go to community health clinics with long wait times. You can take care of your health today, instead of waiting until you have a health emergency. Thanks to the Affordable Care Act (ACA), millions of people can now afford health insurance. The ACA also rules that everyone in the United States must have health insurance. If you don’t buy health insurance, you may have to pay extra in your taxes as a penalty. Health insurance is a signed contract with a health insurance company that requires the company to pay for some of your health care costs. That doesn’t mean they will pay for everything. You will still have a responsibility to pay some costs, like your monthly premiums and your copays when you visit the doctor. With health insurance, you can see the doctor when you need to, whether that means regular checkups to stay healthy or when you’re sick. Now you can buy health insurance through the Health Insurance Marketplace. The Health Insurance Marketplace (also called Health Exchanges in some states) is a new way to help you find and buy insurance. The insurance covers more of your medical needs, including visits to the doctor to help you stay healthy. The insurance may be more affordable, with different plans to choose from depending on what medical care you think you’ll need. You might also qualify for tax credits from the government that can help make your health insurance even less expensive. People with health insurance are better able to take care of their health. They can afford regular check-ups so little health problems don’t turn into big ones. With health insurance you don’t have to go to crowded community clinics, or wait a long time for medical care. You get better and faster care to help you stay healthier. Back to the top. There are different types of programs that people can be eligible for. Many people receive health insurance through their job as a benefit. They may pay a small cost each month for their insurance, or no cost at all, depending on the company they work for. Other people receive Medicaid, which is insurance from the state. There are also other health insurance programs, like Medicare, which is for seniors age 65 or older, or the Children’s Health Insurance Program (CHIP), which is specifically for children. These programs have special requirements. People who don’t get insurance through their job, Medicaid, Medicare or CHIP have to buy it on their own. It used to be very expensive, and sometimes it didn’t pay for enough care. Back to the top. Parents can keep their children on their health insurance plans until they turn 26 years old. Insurance companies cannot turn down people who already have medical conditions, sometimes called “pre-existing conditions.” Before, a company could decide not to insure someone because they had a medical condition like diabetes, or because they had cancer in the past. Now, everyone must be accepted. Insurance companies cannot cancel people’s insurance plans if they get sick. Insurance companies cannot set a limit on how many medical bills they will pay for someone on their insurance plan. Preventive care is now free. Your insurance cannot charge you for doctor visits for babies, vaccinations, annual check-ups, screenings and other care that helps you stay healthy. You can buy your insurance in the Health Insurance Marketplace (Marketplace). Before, if your job didn’t give you health insurance, you had to buy it on your own and it was usually very expensive. Health insurance plans now have to cover a certain amount of care. Before, each company made their own decisions about what they would pay for and to what amount. Back to the top. pediatric services, including oral and vision care. Back to the top. Preventive care means care that helps you stay healthy. These are services that prevent or help you from getting sick. It’s also better for your health and your enjoyment of life. No one wants to be sick. Because of this, the ACA has a rule that states health insurance must now always include free preventive care. A good example of preventive care is vaccinations. When you get a flu shot during flu season, that means you will not get the flu, or you will be less sick if you do get it. Because vaccinations are preventive care, your health insurance will pay 100% of the cost, so your vaccines are free. SCREENINGS. Checking to see if people have high blood pressure, depression or other medical issues that might cause serious health problems. If these are caught early, treatment is easier and may work better. CHILDREN’S HEALTH. Health services for children such as checking for autism, checking hearing in newborn babies and vision in children as they grow older, and giving them vaccinations. WOMEN’S HEALTH. Health services for women such as mammograms, checking for cervical cancer, and providing birth control. MEN’S HEALTH. Health services for men such as colon cancer screenings and screenings for use of aspirin to prevent heart disease. Back to the top. Premiums and copays are two different types of costs that are part of having health insurance and health care. A premium is the amount you pay each month to your insurance company in order to have insurance. When you buy car insurance, for example, you pay the insurance company each month, and health insurance is the same. If you don’t pay your health insurance premium, your health insurance will be cancelled. A copay (short for copayment) is a set amount of money you have to pay each time you need medical care—for example, if you see a doctor, get lab tests, or go to the hospital. Different plans have different copays. Some have no copay at all, while in some cases you may have to pay $10 or $25. For lab visits, other tests, emergency room visits or hospital stays there will be other copays. When you choose which insurance plan you want to buy, part of your choice is about whether you want low or high monthly premiums and copays. Each person or family decides what plan is best for them based on how often they think they will need medical care. Back to the top. services. When you have a high deductible, your health insurance premium (your monthly bill for health insurance) is often smaller. Some people choose a high deductible if they think they will not need a lot of medical care, because then their monthly payments are lower. Once you reach your deductible for the year, then your insurance company may pay for a larger part of your health care costs. Co-insurance: Depending on your insurance plan, your insurance might only pay a percentage or a part of your health care cost. For example, if your insurance pays 80% of x-ray costs, and your x-ray is $100, your insurance will pay $80 and you pay $20. Some people choose to pay more for their monthly premium so they have lower or no co-insurance costs. Back to the top. 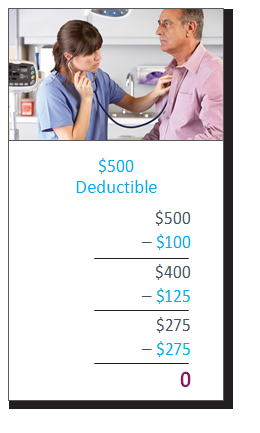 To understand how deductibles work, here is an example of a person named John. John has a $500 deductible. Before John’s insurance pays 100% of some services, John will have to pay $500 from his own pocket. John must pay $100 for x-rays. He still has $400 left in his deductible. John pays a $20 copay (this doesn't apply to his deductible). John gets blood taken for tests and pays $125. John has an emergency and pays $275 at the ER. When John pays all of his deductible, certain services will now be covered at 100%. For example, if he has to get another x-ray he would not pay for it. Each plan is different, so it's important to review all of the details. Back to the top. Each insurance plan has an out-of-pocket maximum: a limit to how much you have to pay for health care in a year. After you reach the maximum, you don't have to pay that part of the costs anymore. The example below can help you understand better. At the beginning of the year, John has spent zero towards his $1,000 out-of-pocket maximum. John must pay $100 for x-rays. John pays a $20 copay. John is admitted to the hospital. His bills total over $10,000, but he only pays $480 of it because he has reached his $1,000 out-of-pocket maxmium. Your health insurance company works with a group of doctors, hospitals, pharmacies and laboratories. They have an agreement about how much they charge, and they can be in one area of your state or in states nearby. This group is called a network. When you sign up with a health insurance company, it is recommended that you see health care providers who are in that insurance company’s network. That means those health care providers accept your insurance plan. If you want to get health care outside that network you may have to pay for it on your own. That’s why, if you already have a doctor, hospital or other medical provider that you want to use, you should make sure they are in a health insurance company’s network before you choose that insurance plan. Some insurance plans will allow you to go see an out-of-network provider by paying more for the appointment, but it is up to you to check if your doctor receives your insurance. The next page provides more information about the different types of health insurance plans available. Back to the top. When you choose an HMO or EPO insurance plan, your insurance will only pay for doctors, hospitals and other care if they are part of your insurance plan's network. If you want to use a different doctor or hospital, you will have to pay for it yourself. HMOs also usually make you get a referral from your main doctor to see a specialist like an endocrinologist or therapist, but EPOs usually do not. With these plans, you can choose any doctor or hospital. If you pick ones that are part of the insurance plan's network, it will cost less. With PPO plans, you can visit any doctor without getting a referral. If you have a POS plan, you can visit any doctor within the plan without a referral, but doctors outside the plan do need a referral. HDHPs usually have low premiums and high deductibles compared to other plans. With an HDHP, you can use a health savings account or a health reimbursement arrangement to pay for some medical costs. This means that your employer takes some of your paycheck and puts it into a special savings account. When you need money for medical care, you can take it from that account. People under age 30 or who have hardship exemptions may be able to buy a "catastrophic" plan. This plan mainly protects you from very high medical costs in the case of a major injury, such as from a car accident. The monthly premiums are low but the deductibles are high. Back to the top. The Marketplace helps people buy health insurance and find out if they can qualify for tax benefits, also known as subsidies, that will make health insurance less expensive. You can apply for health insurance through the Marketplace on your own, either on the phone or on the internet. But because applying for insurance can sometimes be confusing, there are people who are trained to help you, such as Navigators or Certified Application Counselors (CACs), who work with the Marketplace to help you understand your choices. They can help you apply. They can help you figure out what the costs will be, based on how much money you earn and how many people are in your family. They can also answer your questions about how health insurance works and how it can help you. The application for health insurance through the Marketplace will ask you about how much money you earn, how many people are in your family, where you live, what expenses you have and more. This will help you figure out how much you can afford to pay for health insurance, and if you’re eligible for tax credits to make your insurance cost less. Your Navigator or CAC can tell you about the documents to bring to your meeting, such as pay stubs from your job, your tax return, or immigration documents. It takes about one hour to fill out the application with the help of the Navigator or CAC. Back to the top. Remember that health insurance is a contract that you sign with the health insurance company. Signing up for health insurance is the first step. Your next step is paying for it. You will need to pay an insurance bill each month in order to keep your insurance. Health insurance should now be part of your monthly budget. Just like you pay rent and utilities, you must also pay for your health insurance, or it will be cancelled. If this happens and you need to see a doctor or get other medical care, you will have to pay the entire amount yourself. A few days after you sign up for health insurance through the Marketplace, you will receive your first bill. This will come from your new insurance company and it will tell you how much to pay. This amount should be the same as the amount you agreed to when you signed up. If you have questions about your insurance in the future, like how much things will cost or who your doctor will be, call your insurance company, not the Marketplace. Don’t be afraid to ask for help from a Navigator, CAC, or your insurance company. Back to the top. The content for this page was supported by Funding Opportunity Number CA-NAV-13-001 from the U.S. Department of Health and Human Services, Centers for Medicare & Medicaid Services. The contents provided are solely the responsibility of the authors and do not necessarily represent the official views of HHS or any of its agencies.